HOWDY, PILGRIM, I'm BOB. A native TEXAN Come on in, pull up a stump an' sit a spell. Kick yore boots off an' make yore self ta home. Ya'll are welcome to stumble through my webpage. Jest be careful where ya step. Ya can trace yore family name. OR, if ya've a mind to, check out the weather or sports. Or ya can traipse thru the Old Farmers Almanac. So, have fun, ya heah? For a little about me and my family, click on the photo. 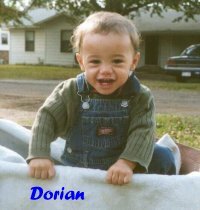 (This is my first great-grandson, Dorian, at 13 months. This page looks better with "NETSCAPE NAVIGATOR 4.0" or. "MICROSOFT INTERNET EXPLORER 4.01"
Thanks for visiting the CORRAL. Hope ya'll had a good time. Why don't ya mark the tallybook or send me an e-mail and let me know what ya think of this mess. Ya'll have a nice day an' ya'll come back, ya heah.